Swimming seems to create such a bond. It brings together people of different ages, beliefs, sizes and outlooks. And yet they seem to share an indefinable something: a lust for life, a joy in the water, a spirit of adventure, a sense of humour, and a love of cake. Today was a day when all that joy came together. It started back in May, when Jackie got married to Gordon, her partner of twenty years. Lesley had the brilliant idea of making her a wedding present from all her swimming friends. We all knitted squares, and some really creative people made beautiful applique'd ones. Several months and several meet-ups to sew them all together later, we ended up with a blanket and a wall hanging. All that remained was to jump out, Jeremy Beadle like, when she went for a dip at her favourite swimming spot, Torre Abbey Sands in Torquay. Well as you can imagine she was totally overcome as were most of us. It felt just as good to be giving as receiving. We then went for a mass dip - I lost count of the heads when I reached 25 - followed by a slap-up lunch. Well, how about that? An absolutely magical moonlit swim. Usually the clouds rain on our parade, but tonight it was cold and clear. It was very exciting arriving at our swimming spot, Oddicombe Beach in Torquay, as I could glimpse the glimmering whiteness of the moon beckoning me through the trees as I drove down the winding road. On arrival at the prom - well - there was a simply stunning moon casting an enormous white pool of light onto the sea, and lighting up the cliffs behind the beach, creating a silvery amphitheatre. As we stood on the shore we felt very cold, and I was dreading getting in. But the sea was a delicious, welcoming surprise. It was warm and I felt comforted and enveloped as we moved around in the soft, smooth water, as it gently lapped against the shingle. It was the first day of November and the red rocks of Livermead were soaked in sun as we got changed on the ledges. Aquatic Ape was down from London with Mrs Ape, as well as Fiona, so we were keen to show them the beauties of Torbay. First stop, the caves at Livermead, aka the Hindu Temples, which, as Jackie said, never disappoint. The sea was a brilliant turquoise as we plunged in off the rocks and swam towards the alluring arches in the cliff. Then were were into the first cave, where we marvelled at the intense blue glow of the water as the light bounced in and off the cave walls. In one recess the water gurgled particularly menacingly. After an exploration through the rest of the caves, watched by the resident pigeons, we went for lunch at the Meadfoot Cafe, before heading over to Anstey's Cove where the water was flat, beautiful and green, and where we had another swim. It was the warmest Halloween ever apparently. As Judy and I got changed on the steps at Sugary Cove, the sun beat down and it felt like summer. However there was quite an autumnal swell in the water, and we had to dodge the rollers as we got in. As we approached the channel which links Sugary to Castle Cove next door, the water foamed deliciously - and a little dauntingly. But we bounced our way in, and bobbed though the chasm with the oak trees keeping watch overhead. 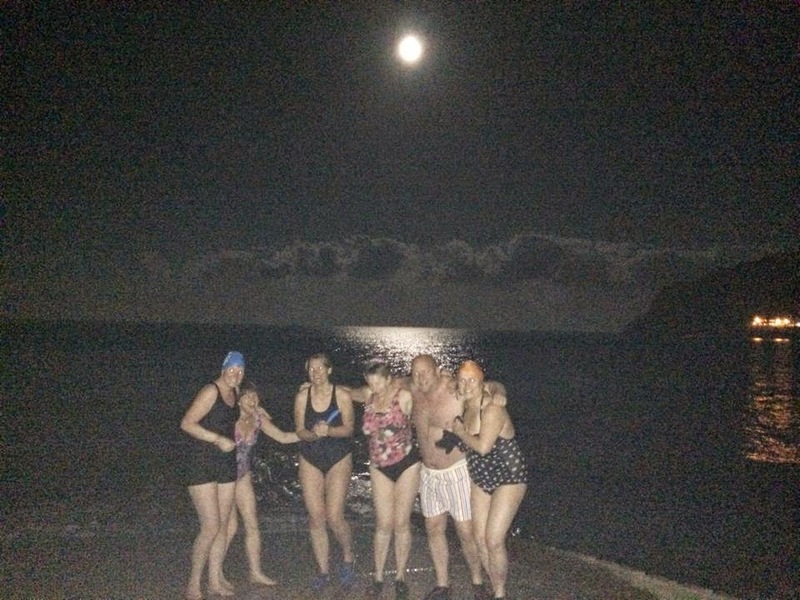 We made it through to Castle Cove where we bumped into another swimmer, Ruth, who had also taken advantage of the good weather and high water for an invigorating dip.